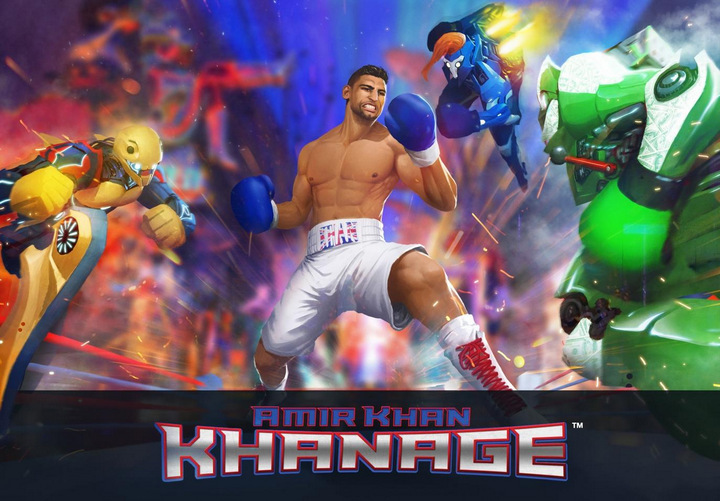 Ahead of the biggest fight of his career, Amir Khan is putting his rivals to task on a whole different platform in new mobile game app Khanage, available on iOS and Android from 2 May. The boxing arcade app, which challenges players to take Khan to the top of boxing, is inspired by the fighter’s own lofty ambitions to top the sport’s coveted pound for pound list, and features a few antagonists not too dissimilar to his real life rivals. The game follows ‘King’ Khan on his quest to be crowned the greatest fighter in the universe and dethrone current champions Dan Ello, Barry Mackyowl and Dollar Bills Jr. One a Mexican warrior with flame red hair, the other dubbed the Beast form the East and the last a flash American with lots of money. In a three-part story trailer for the game, King Khan can be seen confronting each rival before they get the spooks and run off, leaving the brave and somewhat reluctant Dan Ello to take the fight. These champions are so hell bent on avoiding Khan in the game, they send out evil droids to stop him in his tracks. How the story ends though is down to the fast hands of the player as the game lets you take up the fight as Amir Khan and swipe your way through legions of killer robots to dethrone the phoney kings of the sport and collect all the Title Belts. “Going into the biggest fight of my life I wanted to give fans another way to connect with me and my story. I think everyone knows my desire to prove I belong at the top of boxing in the biggest fights, and Khanage is a fun way of expressing that,” said Khan. Amir Khan Khanage is the new mobile game app by Amir Khan and Digital Shoguns. The game will be FREE to download on iOS and Android from 2 May. Khanage takes Britain’s most exciting fighter into an equally exciting sport arcade game that tests users reflexes and boxing technique. Featuring in-app purchases, infinite levels, special kits and video game graphics, this little app packs a mighty punch. Developers Digital Shoguns is one of the UK’s leading 3D animation studios. As sole 3D agency for Hasbro Europe, the London-based studio was responsible for the 3D characterisation of some of its biggest brands, including Monopoly Junior, Scrabble Junior, Cluedo Junior and Game of Life.